Thanks Kerfe. Coming down the homestretch! Thanks Rebecca. Looking forward to the end of this challenge, I can tell you! I wasn’t meant to work in one medium. I have major catching up to do! I just love them though and so I hope to press past the setbacks and keep going! Thanks as always for your good cheer, my friend! What a beautiful quilt block. such a great idea for abstract inspiration. I know how much you love Fall and this sings of it for you! 🙂 Happy Friday Loo!!!! Happy Friday, Jodi! And thank you! I can’t wait to be Queen of the Leaves or whatever you called me last year again hehe! Very pretty in design and colors, Laura. I plan to savor every moment and have no doubt that you will too. Enjoy!! No doubt, Carol! Glad you enjoyed this! Ha ha!!!!! I saw the picture in my reader and said….Laura has been on the quilt blogs and then Lo and behold!!!! lol! 😀 I started out as a quilter but I’d much rather paint a quilt than fight with that machine hehe! Aha!!!!! I thought that painting looked like you knew how to do a quilt. Secret talents. Ooo I’d love a quilt like that! Maybe even quite small like a pillow cover. Gorgeous as usual anyway Laura! Thanks so much, Iris! You’re so kind! Inspiration is everywhere Laura! Makes me want to get our some fabirc and sew a quilt block! Yay, I hope you do it, Sharon! You are so right; inspiration is everywhere. I do think we need to open our eyes a little wider at some times to take it all in, but it is always there, sometimes in the pattern of a shadow from a tree. Literally it is all around us. Thanks, sweet friend. ❤ Hippety hop! Very nice, love the colour combination. (Fainted) Oh my goodness – that is an awesome piece and I am so honored I provided some inspiration! That is a gorgeous use of color in your painted quilt block! Love it!!!! It looks like a hallway. Love it! I’m so glad you love it, Laura! Have you ever tried making a little wall quilt? No I have never quilted. I think it looks amazing! A modern art masterpiece! Thanks, Margaret! I started as a quilter too, same thing (isn’t that so strange) but I do find it much more fun to paint a quilt block than to sew one lol! Glad you enjoyed it! you know you probably had told me that! isn’t that interesting? We’re sisters on opposite coasts! lol thank you, Lucy and I do love that name! I like your quilt block! What a fun idea! Thanks, Teri! Much easier to paint than to sew! 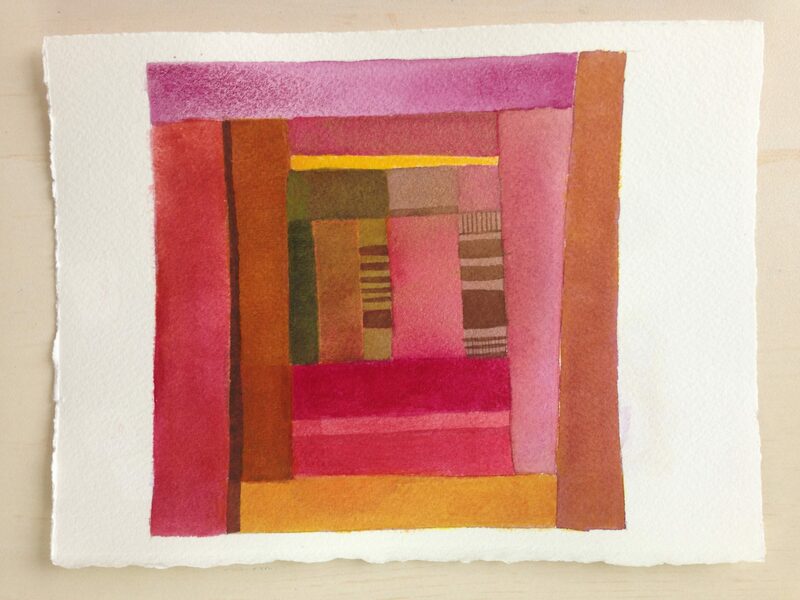 I like this geometric piece Laura, good color palette too. Thank you, Myriam! Glad you enjoyed it!